The entry point of the eventual Galaxy S10 trio, or the so-called Lite version, is tipped to arrive with an SM-G970 model number, and this internal ID just hit a browser benchmark with a great score. The eventual S10 with a flat display and a dual camera on the back scored 514 out of 555 points but the benchmark was run on Samsung's own mobile browser which is among the fastest website rendering machines out there. The purported S10+ (SM-G975) has also been tested, but its higher, 1440x3040 pixels resolution made it hit a somewhat lower score than the Lite. The more interesting part is that the displayed resolutions (multiply both numbers by 3.5) tip a final aspect ratio of 19:9, just like a previous leak for the Galaxy S10+ indicated. For comparison, the current Samsung flagships sport 18.5:9 ratio and they are among the least bezelicious phones out there. 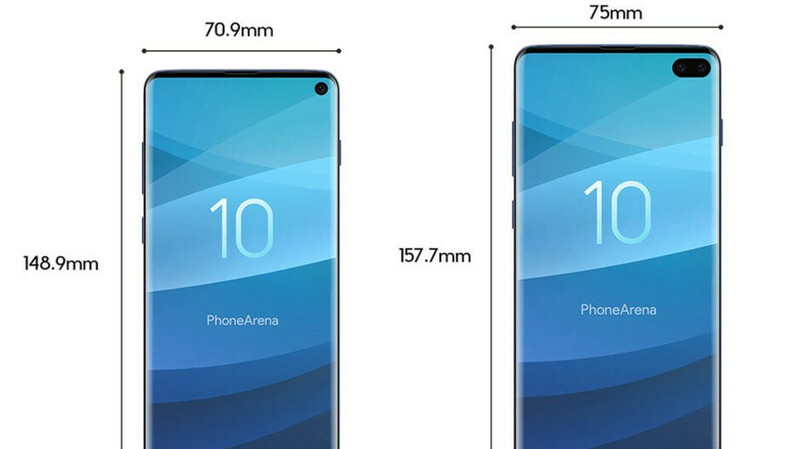 An even taller aspect ratio means that the S10 trio may indeed shrink the top and bottom bezels even further, as the CAD renders that were sent to us depict, aided by Samsung's newfangled hole-in-display Infinity-O design. A chin on top and bottom which isn’t symmetrical plus a hole or pill. Ugly = failure = stock on drawers and get dusted and will be used as promo for the next iteration. Of course the iBrainwashed folk on here will call a product a failure when it hasn't even been released yet. I'm in the minority, but I think the hole is much more aesthetically pleasing than any other option currently on the market. With a larger aspect ratio, the lack of symmetry might be intentional. Those who prefer a bezel can make the pill area black, which will likely be similar in size to the bottom bezel. Those who want every Pixel possible can expand the screen to encompass the pill. Not a perfect solution, but better than anything else out there. Agreed. I also own the Note 9 and love the design. However, every review of the Note 9 and the S9 before it denigrated the recycled design. If this hole in display gimmick is the way Samsung continues to avoid the notch while still giving the bezel-free harpies something to get excited about, I'm okay with it.